In 2017, you couldn’t escape all the talk of “digital transformation” in the IT (and business) community. It’s a common opportunity and challenge for most organizations that will continue throughout 2018 – but how does one “digitally transform” their organization? The important thing to understand is that it’s ultimately business transformation. Whether you want to think of digital transformation as business transformation or not, there’s already a body of relevant good practice available to organizations in the form of The Business Transformation Framework (BTF). It’s a practical frame of reference to help organizations design, develop, plan, and govern organizational change. And given that digital/business transformation is really about people and “ways of working” change, it’s well suited to the organizational change – the impact on business processes (ways of working), organizational structure, and culture – required. And, having recently read the related “Business Transformation Framework – To Get From Strategy To Execution” book, I’ve put together 10 tips to help you drive the organizational change required for transformation in your organization. The most successful organizations are the ones that can adopt and adapt new ways of working to stay aligned with customer and business needs, with the ability to continue to deliver and improve on what’s needed. Being flexible enough to accommodate new or changed needs requires organizational change capabilities; but all too often, those involved can forget key information or miss an important activity or step because they don’t have the right structure and support in place. To help, the BTF offers a structured approach – based on good practice – to making the required connection between strategy and business transformation activities. It has evolved over time, from a good practice approach to information planning to a practical method for the design, development, planning, and control required for organizational change. Ultimately, it’s all about having a plan people! The first rule of driving transformation (digital or otherwise)? Have a long-term plan, and a strategy that clearly sets out your mission, vision, and core values (including specific and measurable objectives). With a clear strategy in place, you can define and focus your transformation and organizational ambitions over the long term. However, if your strategy is too vague, lacking in direction, or simply not communicated well enough, then you’ll start to lose focus and/or traction. Draw up an “inventory” of what’s available in terms of strategy and assess how complete and specific it is. Consider both the high-level primary objectives from senior management and the SMART objectives used by people carrying out day-to-day tasks to get the whole picture. Understand the business/operational model and ways of working. Use knowledge management to centralize models, goals, and information. Valuable organizational knowledge shouldn’t just exist in people’s heads no matter how senior they are! Clarify and articulate your strategy so that it’s clear and understood by all. Action items are specific deliverables that must be carried out to meet the desired outcome. Put simply, action items are the steps that take you from the current state to the desired future state by making small, specific improvements along the way. What needs to happen and what the result(s) look like. How the action item achieves a specific goal or removes a constraint to achieving that goal. Which part of the organization is affected and what specifically needs to change. The kind of action that’s needed. Research? Decision point? Implementation? 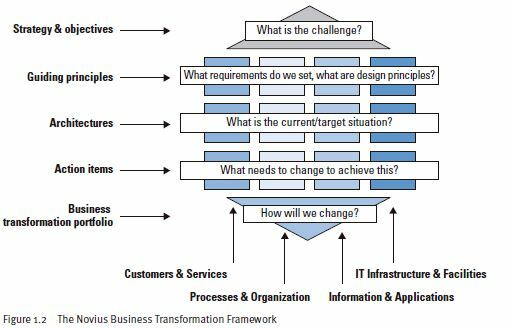 Listing and categorizing your action items gives your organization the beginnings of a plan as well as the starting point for your “business transformation portfolio” (as shown in the diagram below and expanded upon in Tip #4). The business transformation portfolio – here is an example – brings together all the action items, and then groups, prioritizes, and plans them into a single roadmap. Clustering action items into projects – grouping action items together so that they logically fit into projects. This can be done by grouping items by relationships, service, or business domain. Defining the projects to prioritize – each cluster of action items is a candidate project, something that can be elaborated on and drafted into a project charter for formal consideration. Prioritizing the projects – by scoring each candidate for value-add and risk. Preparing the roadmap – by mapping out the prioritized projects and creating a schedule of work with defined timings, costs, and resources. Most organizations are varied and complex; and, in order to be effective in organizational change, they need to be able to proactively manage their complexity. Please return for my next five BTF tips where I start to get more practical across the planning process, aligning transformation activities to business as usual (BAU) activities, and how to get started. Do have any positive or negative feedback, on using the BTF in your organization, to share? Please let me know in the comments! How Many of Your Employees Are Happy with Your IT Service Desk?